I’ll go ahead and say sorry. I’m sorry in advance for the things we’ll do and say on furlough. We’ve only been away from the States for a year and a half, but we’ve already forgotten a lot about how to live there. When we show up to speak at your church and neither of my children can find their shoes, it’s not because we’re neglectful or disrespectful. It’s simply that shoes have become an accessory, not a necessity, and why in the world would you wear shoes when there are puddles to splash through and soft grass and warm stones on the dirt road? And, yes, I realize their toenails and the bottoms of their feet look like they need a good scrub. About the time the stains fade and their feet look respectable again, it will be time to return to the land of unfettered soles. 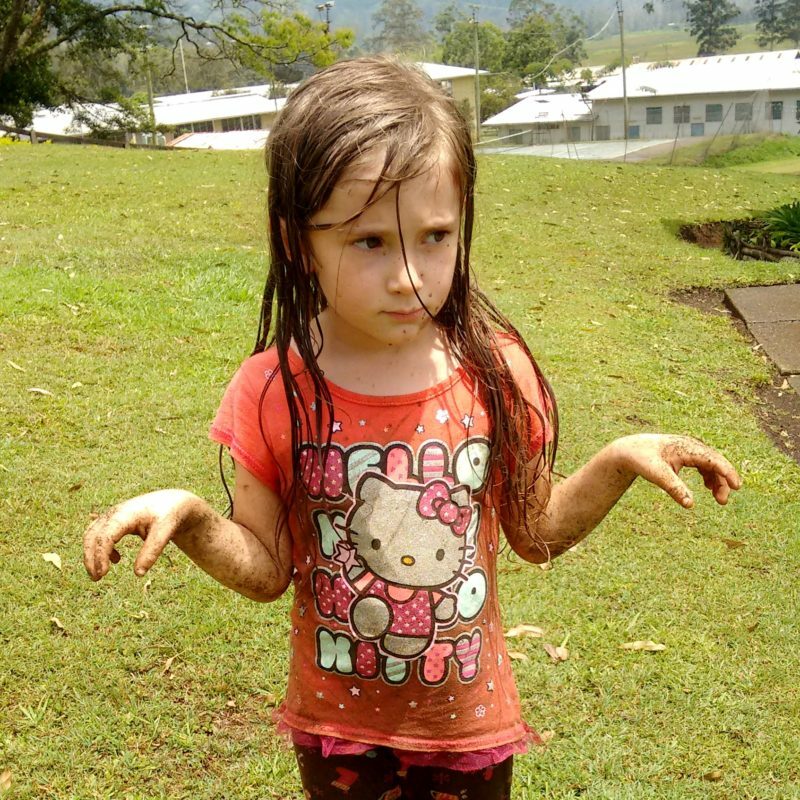 While we’re on the subject of stains… The tropics are full of all kinds of glorious stain potential – mud and mangoes and brilliant green grass and hot pink rose petals. 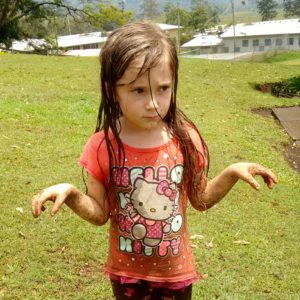 I realized recently that my five-year-old has no idea how to keep her clothes free of drips and grime and the holes torn by life lived all-in. We had a conversation the other day about how she’ll be expected to dress in the States, and she stared at me like I was speaking a foreign language and asked, “What does matching mean?” So, yeah. We’ll try, but I can’t make any promises. A lot of days we’ll be doing well to just have everybody clothed and in their right mind. Well, at least clothed. I can’t promise the right mind thing either. I’m pretty sure I’ll look seriously unstable the first time I go grocery shopping. I’m already getting teary-eyed thinking of things like store bought sourdough bread and lunchmeat and cottage cheese and plums and grapes and spinach and name brand cereal I don’t have to mortgage my house for. Please forgive me if I get spacy over all the choices, or if I suddenly get choked up over missing stepping around my friends’ kids in the aisle while I have a conversation in Tok Pisin with the guy stocking the coffee shelf. And when it comes time to pay… Oh, boy. I haven’t touched a debit card in 18 months, and U.S. dollars look strange to me now that I’m used to working with colorful Papua New Guinea kina bills. I’m already having dreams about showing up at the grocery store with PNG kina, Australian dollars, Filipino pesos, and Thai baht, but no American cash. And that’s not an entirely unlikely scenario. So if you’re with me and this happens, just pat me on the head, apologize to the cashier, and get me quickly to a place where I can dissolve into giggles and tears in relative privacy. Coffee would also help. Embarrassment is a guarantee as we try to fit our PNG Highlands selves back into a temporary place in American society. There are these words, words that sound like things in English that would be met with a quick bar of soap, but they don’t have the same shades of meaning in Tok Pisin. We’ve talked with our kids about these words, but they just might slip up and say them. We might, too. There are also things that are acceptable conversation topics here that might raise eyebrows in the States, things like diarrhea, intestinal parasites, and fruit bats. We might forget where we are. We’re not trying to be offensive or weird, I promise. There are things that have shifted inside us while we’ve been gone. We’ve seen things, experienced things that run now like quiet undercurrents in us. We may have a hard time explaining these things, but that doesn’t mean we don’t want you to ask. Please ask. Part of us will always be tied to red Carolina clay, at home among the pines and dogwoods. 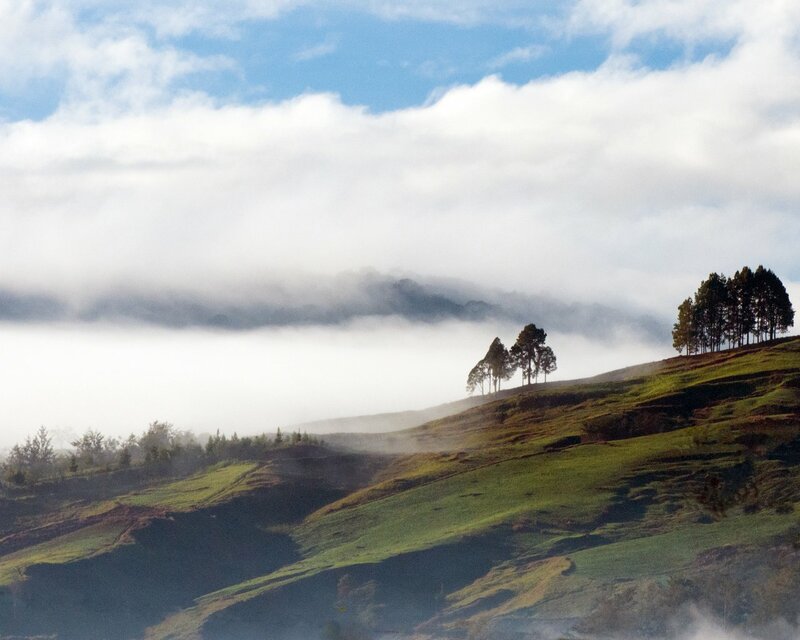 And part of us will always long to hear the wind in the tall kunai grass that grows on the hillsides around Ukarumpa. Two homes. Always somewhere to be homesick for. Please understand that we don’t love the U.S. any less. It just hurts to have your heart stretched enough to hold places on both sides of the world, and at times we might need space to ache a bit. We have stories if you ask us. Like that time the giant coconut spider joined me as I bathed. Or when my husband thought a police license check was an attempted hold up. Or how some of our students showed up for a formal dinner riding on a couch being carried by a front-loader. Or what it feels like to see people hold a New Testament in their own language for the first time. We want to hear your stories, too. We really, really do. We’ve missed you. Don’t be afraid to treat us like you always have. We’ve changed in a lot of ways, true. But we’re still us. Maybe less stylish, more confused versions of us, but us, nonetheless. We may be leaving home, but we’re also going home. Best ever description describing cultural transition! Thank you for using your God given gift of writing! Praying for you all as you leave home for home. I am ready! Anytime you are ready we will being the band back together ….just for you!! !